This salad is so simple yet looks so pretty and as an added bonus tastes amazing! It’s the perfect dish to bring along to a dinner party if you want to impress friends but don’t have long to throw something together. If you feel the dressing might be a bit of pomegranate overkill a mixture of apple cider vinegar, tahini, olive oil and lemon would also go nicely with this. Mix the zucchini slices in the coconut oil, salt and pepper until all the slices are coated. Heat up a grill pan or BBQ grill and cook the slices for about 4-6 minutes on each side until both sides are quite tender. Transfer to a plate lined with a paper towel and leave to cool. Lay the rocket out on a plate. 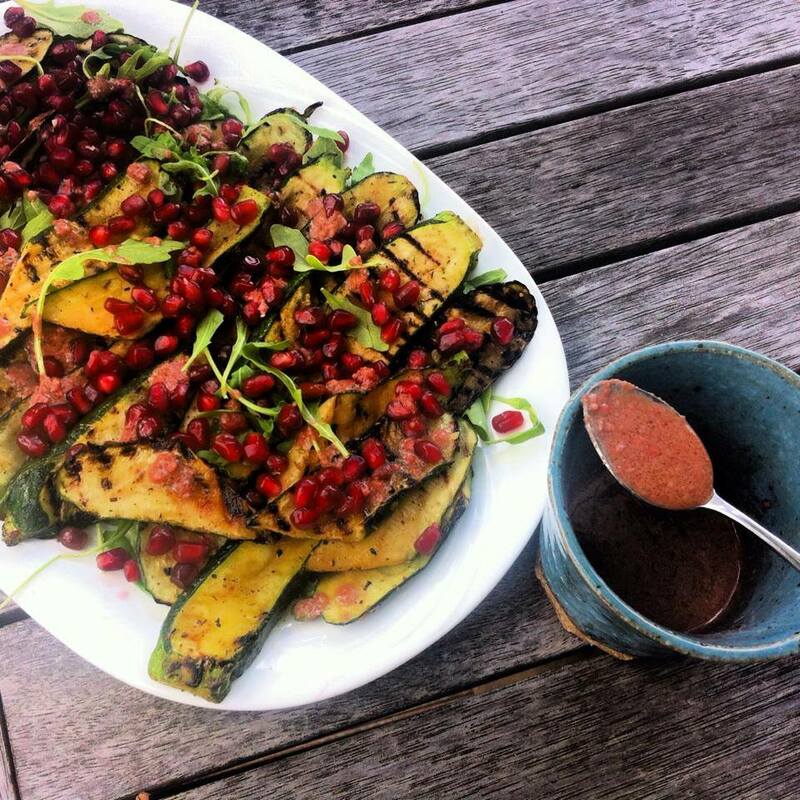 Place the zucchini slices on top of the rocket and sprinkle over the pomegranate seeds and almonds. Mix all the ingredients in a blender until it forms a smooth and creamy texture and either drizzle over the salad or serve on the side. Mia, these are excellent. Truly, excellent! Thank you 🙂 Your new site is looking great!